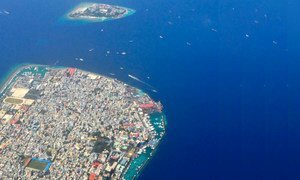 Aerial view of Malé, the capital of the Maldives. “The Secretary-General urges the Government to refrain from all acts that result in the harassment and intimidation of Members of Parliament, political parties, civil society and the media,” according to a statement issued by a UN spokesman. Mr. Guterres “encourages effective dialogue and consultations on political issues,” concluded the statement. Concerned by the increasing polarization in the Maldives, which has made dialogue among the Government and political parties increasingly difficult, United Nations Secretary-General Ban Ki-moon has encouraged all concerned to work toward an inclusive dialogue.